Head Anatomy - want to learn more about it? In this page, we are going to focus on those five less evident features and learn more about them. All the masticatory muscles move the mandible by acting on the temporomandibular joint. Watch the following videos and read the article to learn more about them. Overview of the muscles responsible for facial expression. There are quite a lot of them, right? Luckily, they become easier with repetition. In order for you to face anatomy head-on and make your life a little easier with learning the above muscles, tackle the following facial muscles quiz. In addition to the major ones, there are also some minor salivary glands. Watch the following video and read the article to learn about all of them. There are several arteries supplying the head with oxygenated blood. The most important ones for head anatomy branch from the external carotid arteries. These include the: superior thyroid (mostly supplies the neck), ascending pharyngeal, lingual, facial, occipital, posterior auricular, and maxillary arteries. Watch the following videos to learn all about the major arteries of the head. The most important one in this list is the maxillary artery, the largest terminal branch of the external carotid supplying the deep structures of the face. An equally important artery is the facial artery, which supplies the muscles of facial expression. Since the head is such a ‘vast’ anatomical region, it’s innervation is quite extensive. For the purposes of this page, we’ll only talk about the relevant nerves for the previously mentioned anatomical structures. The trigeminal nerve supplies sensory innervation to the forehead and cheek regions of the face via its ophthalmic and maxillary branches. The mandibular division supplies both sensory and motor innervation to the jaw and masticatory muscles. The facial nerve provides motor innervation to the muscles of facial expression. Salivary glands are controlled by autonomic nerves stemming mainly from the same facial nerve. The cervical plexus is formed by the C1 to C5 spinal nerves, giving off two branches innervating the head: lesser occipital and greater auricular nerves. This custom quiz covers the muscles, nerves, and arteries of the head. 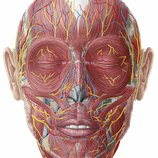 This is an article on the anatomy and functions of the muscles of the face. Learn all about the muscles of facial expression here. This is an article covering the anatomy of the superficial nerves of the face and scalp. Learn all about those important structures now at Kenhub.